The precursors to the carousel may be as much as 1,500 years old when baskets lashed to a center pole were used to spin riders around in a circle in ancient Byzantium. During the twelfth century in Turkey and Arabia, men and their horses played a game in which delicate balls filled with perfumed water were tossed between riders. Losers would sport a definite aroma, and winners were presumably the better horsemen. The game was called carosello, or little war in Italian. At the French court in about 1500, this game blossomed into an elaborate pageant with spectacularly outfitted horses and riders. Horsemen added the challenge of trying to lance a small ring while galloping at full tilt. If the rider snagged the ring, it pulled away from a tree or posts with a stream of ribbons behind it. Contestants could practice this game by mounting wooden "horses" that were legless and resembled vaults used in gymnastics and that were mounted to a circular platform. As the platform rotated, the riders would try to spear the brass ring. Craftsmen observed this play among the nobility and began building platforms with wooden horses mounted on them for commoners and their children to ride. These carousels were quite small because the power source for turning the carousel was a mule, man, or horse. In 1866, Frederick Savage, an English engineer, combined steam power with his carousels and drew crowds to the European fairs he toured with his machine. Steam-driven carousels reached the United States in about 1880. Savage was also responsible for developing the system of overhead gears and cranks that allow the suspended horses to move up and down as the carousel turns and simulate an actual ride on horseback. As carousels became more popular, they acquired a number of names including karussell (Germany), carrousel and manages de chevaux (France), gallopers and roundabouts (England), and merry-go-rounds, whirligigs, spinning or flying jennies, dip-twisters, and flying horses (United States). Today, preservationists tend to prefer the name carousel over these others for its historic context. The jewels of the carousel have always been the horses. Thanks to the stream of immigrants from Europe, the United States had a thriving carousel industry by the 1870s. Expert carvers, such as Gustav Dentzel from Germany, had practiced cabinetry and carousel crafting in their homelands and quickly established businesses in America. Carousel factories like The American Merry-Go-Round & Novelty Company were full-time manufacturers, but other makers including Charles Looff and Charles Dare in New York City, Dentzel in Philadelphia, and Allan Herschell in upper New York state transformed their furniture businesses and machine shops into at least parttime carousel production. Wood workers and carvers prided themselves on fashioning beautiful crested horses with flashing eyes, flying manes, realistic poses (for both standers and jumpers), and ornate ornamentation from flowers to heraldic crests, French fleurs-de-lys, jeweled saddles and tassels, and patriotic symbols like eagles and profiles of presidents. Of the carousel figures made in the United States, 80% were horses and 20% were made up of a menagerie. The Herschell-Spillman Company produced kangaroos, pigs, giraffes, sea monsters, frogs, and dogs and cats. The carousel's zenith in America was from about 1900 to the Depression. During this period, jobs were plentiful, motor transport was available, and amusements for the family were sought. Craftsmen were also still in demand, but as technology advanced, it also invaded the carousel business. 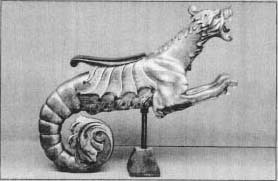 Factories began to build cast aluminum horses (and animals cast in fiberglass and plastic soon followed), and the carvers had to find other trades. Repair work was available as the wooden horses aged, but often amusement park operators resorted to patchwork maintenance instead. In the early 1970s, the National Carousel Association was formed. Antique horses began to sell on the auction blocks of Sothebys and Christies at phenomenal prices, and collectors sought to acquire originals by carvers like Salvatore Cernigliaro or Marcus Charles Illions. For those with smaller pocketbooks, bisque porcelain figures and small-scale carousel horses also became collectible. Today, only two or three carousel makers practice their craft in the United States although there are many hobbyists who carve their own horses and refurbish antiques. The carousel revolves around a stationary center pole made of metal or wood. An electric motor drives a small pulley that is controlled by a clutch for smooth starts. This pulley turns a drive belt and a larger pulley that turns a small-diameter, horizontal shaft. The end of the shaft is a pinion gear that turns a platform gear. The platform gear supports a vertical shaft that turns another pinion gear and final drive gear attached to the support beams of the carousel, called sweeps, which extend outward from the center pole like the ribs of an umbrella and support the platform, horses, and riders. The sweeps hold cranking rods that are turned by small gears at the inner ends that are driven by a stationary gear on the center pole. Horse hangers are suspended from the cranks, and as they turn, the horses move up and down about 30 times per minute. A typical carousel platform with horses and riders may weigh 10 tons and be driven by a 10-horsepower electric motor. After the motor's revolutions are reduced by the series of gears, the riders on the outer row of mounts will gallop along at about 5-11 miles per hour. Carousel griffin made by the Hershell-Spillman Co. of North Tonawando, New York. Carousels, with colorful figures attached to a revolving horizontal mechanism, have amused the masses since the end of the 1700s. By 1800, carousels were advertised as amusements as well as an activity that got the blood circulating. After the Civil War, a number of merry-go-round manufacturers started up businesses and popularized the carousel. The griffin depicted here is the product of Hershell-Spillman Co. of North Tonawanda, NY, a well-known carousel manufacturer nearly a century ago. It is part of a 191 3 merry-go-round now operating six months of the year in Greenfield Village in Dearborn, Michigan. With its one-man band mechanism playing charming turn-of-the-century tunes, this carousel remains a great favorite. It was a "park-style model," manufactured for permanent placement in a park. (Some, like one still operating in Story City, Iowa, were designed to travel and were not for permanent installation.) Children can ride horses, lions, tigers, zebras, and even leaping frogs—all exquisitely carved and painted. Today, carousel figures are treasured for their colorful beauty, and carousel figure collectors pay thousands of dollars for a single animal. A typical carousel platform with horses and riders may weigh 10 tons and be driven by a 10-horse-power electric motor. horses, which are carved from basswood, the oak platform, sweeps, rounding boards, panels, and mirror frames. The platform and various panels and gingerbread work were made of wood or plaster in the old days, and today they may be made of these same materials or may be cast in plastic or fiberglass. The tent-like top is made of canvas. Music is supplied by a band organ that is also electrically or mechanically powered and plays much like those of a player piano. Specialty manufacturers provide the organs. 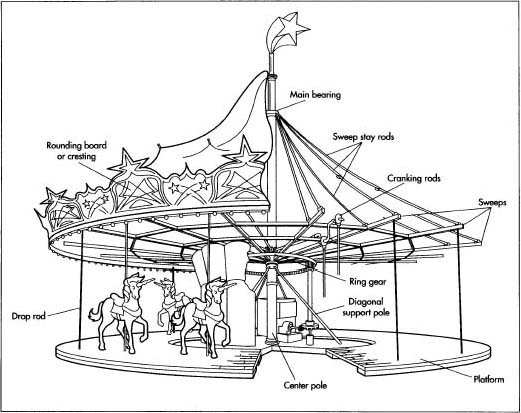 Design of a carousel begins in the middle at the center pole. A bearing at the top of the pole bears the entire weight of the carousel. The sweeps (arms or umbrella-like ribs) of the carousel are suspended from the top bearing, and two rods extending down from each sweep support the platform. About half-way down the center pole is a center bearing or hub that keep the works from shifting from side to side. The motor, of course, spins the whole umbrella structure around. From the midpoint, a series of diagonals keep the center pole aligned with a cross-brace that rests on the ground. A center pole that is 15 in (38.1 cm) in diameter will support about 50 horses and riders. The carousel revolves around a stationary center pole made of metal or wood. An electric motor drives a small pulley that is controlled by a clutch for smooth starts. Horse hangers are suspended from the cranks, and as they turn, the horses move up and down about 30 times per minute. with wooden animals were made in the period from the 1930s to 1994, and only about 10 new wood-horse machines have been made in the United States in the last 60 years. All new wooden carousels are, therefore, custom-made, although refurbishing old machines is also a part of this industry. When a carousel builder receives an order, he works with the customer to determine the size of the machine based on cost and maintenance considerations. Most carousels today may be built from scratch or from refurbished mechanisms. In either case, today's maker must be a metal fabricator with a shop to concoct the metal pieces. Traveling carousels can also be manufactured with little variation from those fixed in place except that the steel center pole is hinged so it will fold in half to be transported in a van. All the other pieces can be broken down by two men in about 3 hours and carried in a truck including a platform made in sections and the horses that have the metal hangers removed from them. The carousel builder purchases a band organ for the "new" carousel from a specialty manufacturer. Today, the Stinson Organ Company of Ohio is the only manufacturer to still make custom and productline band organs; five or six manufacturers including Wurlitzer made band organs during the heyday of the American carousel, and many other organs were imported. Band organs are played by air pushed by a bellows through wooden pipes, stops, and valves. Because the wood parts are highly subject to temperature and humidity changes, the organs are constantly out of tune and require considerable maintenance. They make music by forcing air through perforated paper rolls, much like a player piano, and the rolls cycle continuously from one to another, thanks to a device called a tracker frame developed by Wurlitzer. Although there is no sound like a real carousel band organ, maintenance costs often force buyers of "new" carousels to use tapes or compact discs for their music. The romance of the carousel rides with its animals, however, and the auction prices of up to $60,000 per horse for antique ponies have brought a new awareness to the importance of equipping a new carousel with the genuine article. Amateur carvers and woodworkers have also been attracted to the carving of carousel critters; and body blocks that include the body, head and neck, tail, and legs can be purchased in various sizes for carving. Assuming the carousel builder is carving a wooden horse from scratch, he chooses a size and weight suitable to the overall design of the carousel and selects an appropriate artistic design. This may be based on a theme for the carousel or on the customer's favorite historic model. The outside of the carousel animal is called the "romance" side and is seen by onlookers. This display side is usually more ornately decorated than the inside. Many of the original carousel designers made full-scale sketches of their horses so that details were properly conceptualized and scaled and so that several carvers could work on parts of the same horse. Today, one-eighth scale models are sometimes made for the designer's models and the customer's approval. Full-scale paper patterns are glued to pieces of basswood to cut the body, legs, and other parts. Basswood is used because it is hard and close-grained, and the grain must run the length of the part for strength. A jigsaw or coping saw is used to cut the parts, and the parts are glued together to form the carving block. In the old days, the "glue-up" was done by a skilled craftsman who was an expert at the types of glue, amounts, and pressures required to prepare the carving block. Each carver has his own preferences for how to proceed with carving. Many start by using the paper patterns still glued to the animal to rough-cut the shapes, a process called boasting. Detailed carving follows, and this is usually done without reference to patterns but with a sense of the wood grain and the artistic creation that has been trapped in the wood. The completed carving block is sanded, and sometimes other small details are glued on. If the animal is for display, rather than for a working carousel, a base or stand suitable to the size and configuration of the beast is also made. A footrest is also made for each animal (unless it has stirrups or other substitutes), and these are carved and painted to match the animal. Preparation of a carousel animal up to the painting stage typically takes about 35 hours per animal. The carved horse is stained, primed and painted, and varnished to suit the design of the carousel. Platforms are painted to complement the carving, but overhangs are sometimes brightly colored to highlight the details of both the overhangs and the animals. Traditionally, the animals are painted bright colors, and the paints are chosen for durability and safety as well as appearance. Removal of old paint may be one of the most time-consuming tasks in refurbishing old animals; some have as many as 30 coats of paint that have filled the finely carved details. Dappling, addition of gold or silver leaf, placement of horsehair tails, and burnishing of metallic leaf provide other touches of realism and elegance. Rhinestones and other jewels are often added to the romance side of the finished horse. According to carousel maker Chuck Kaparich, carousels and carousel animals are experiencing a resurgence. Thanks to the drawing power of the colorful carousel display and music, historic town centers and shopping malls are commissioning new carousels or refurbishing their old ones to attract customers to these areas. Kaparich expects the romance of the carousel to always remain with the American public, but, realistically, he acknowledges the limited demand and the likelihood that the present resurgence may only have a lifespan of 10 to 20 years before carousels are again temporarily forgotten. It is hoped that new generations of carousel aficionados will recall the current boom and add the magic of their mounts, music, and motion to a bank of undying memories. Fraley, Nina. The American Carousel. Benicia, CA: Redbug Publishing, 1979. Fraley, Tobin. The Great American Carousel: A Century of Master Craftsmanship. San Francisco: Chronicle Books, 1994. Fried, Frederick. A Pictorial History of the Carousel. Vestal, NY: Vestal Press, Ltd., 1964. Marlow, H. LeRoy. Carving Carousel Animals From 1/8 Scale to Full Size. New York: Sterling Publishing Co., Inc., 1989. Carousel News & Trader. http://www.carousel.net/trader/ . Chuck Kaparich, Carousel Man of Missoula, Montana. http://www.carousel.netlkaparich . Classic Carousel Collectibles. http://www.finest1.com/carousel/ .